As a Toronto wedding photographer I like not only to deliver great imagery to my clients but also enjoy the wedding day with the bridal party. Yes, I could be their father but when it comes to fun and creativity even the kids cannot beat me. At this particular wedding at Liberty Grand I had the pleasure to work with a great bridal party. We are talking about an Italian groom and the Jordanian bride. Both nation analyses know how to party hard. I certainly don't believe that photography has to be stiff and formal. I'm rather of the opinion that wedding photography is about the experience you deliver the couple on their special day. After all no one cares about dramatic light, beautiful scenery and splendid poses and they have to suffer on their big day. This is something I learned during a workshop with Jim Garner, one of the top wedding photographers in the world. He describes two different weddings where one photographer, a master the craft and a perfectionist made the couples spend a long time so that he can create that epic image that could win him in an award. On the other hand we have the Maverick, the wedding photographer who knows when enough is enough and values the experience more than magnificent lighting schemes. Jim is describing the couples reactions when they see their wedding albums. To his surprise, the couple wish you the more beautiful wedding album looked at it and threw it in a box. Meanwhile, another couple, whose wedding album was not even close to the first one were ecstatic when the opened the photo book. It was then when she realized wedding photography is not hundred percent about images but rather about the experience you deliver to the bride and groom. If you capture beautiful moments, the love and you have fun photo shoot, that it is sure formula for success. Unfortunately in the greater Toronto area I see a lot of photographers was take with their old habits and force the couples to go through their 100 or so poses that they have been doing for 30 years. According to my last pricing research study, those photographers had to drop prices once again to be able to book more weddings. 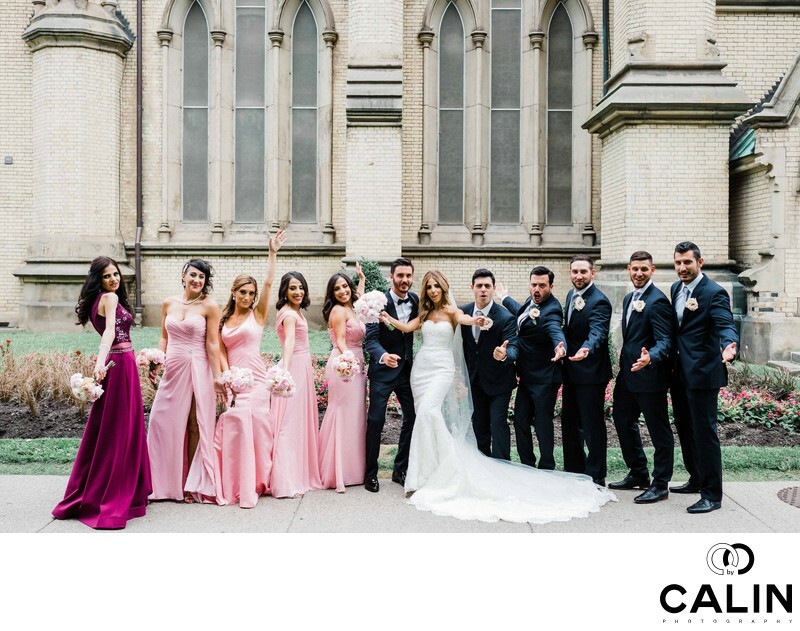 Meanwhile, successful studios are cornering the massive Toronto wedding photography market with their fresh, stylish approach to imagery. Shoot to my belief that you have to put on a show for the bride and groom so that they enjoy the experience, I asked the bridal party to give me a pose, which they were happy to do. My objective is to deliver outstanding images and a phenomenal experience on the wedding day. The fact that the bride and groom included this photograph in their wedding album says it all. It is not the most dramatic images that made it into the album but rather the genuine moments we capture that matter to the bride and groom. 30 years from the wedding day, what will matter to the couple is the time spent with friends, family and guests and not the epic images we created. As professional photographers we are obsessed with beautiful light, perfect composition and sometimes we forget that what we think is a good photo is totally different from what the couples want. They want to see their mother cry their grandma dance the whole night and there grandfather clean shots with the bridesmaids at 2 o'clock in the morning as destination wedding. That's the soul of photography!